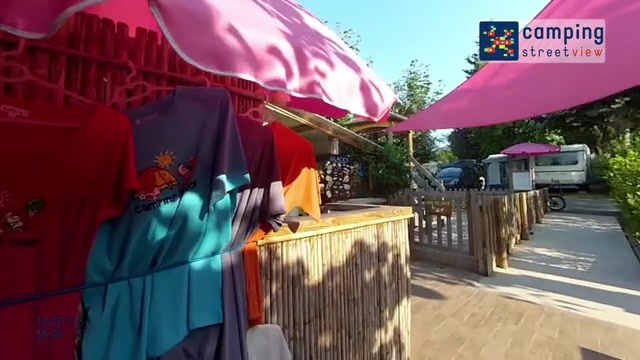 Between Toulon and Hyères, Lou Pantai is an eco-friendly campsite boasting a family atmosphere, close to the beaches. It has won a number of awards such as the European Ecolabel for its environmental approach, Green Key & camping quality label . Des emplacements délimités par de la végétation méditerranéenne et des sanitaires entièrement rénovés pour des séjours tout confort Electricité comprise dans tous les forfaits Compensez les émissions carbone de votre trajet en plantant 1 arbre (4 €, option à la réservation). Le 2 à 4 personnes économique, terrasse couverte face aux champs. l'hébergement économique et sympa avec son bardage bois et ses bambous. It is a very small campground and with the way the cottage was located, it wasn't very comfortable to sit outside. The terrace is small, so with 5 people....cramped. You have to do a full clean which is, considering the price, not really what we wanted. The beds are not very comfortalbe (too hard). And, of course....the swimmingpool hours are just not very chill. small outside space. If you park the car infront of the cabin, there is no other space to sit. The shower tap was rediculously hot. So, we really had to warn the childeren when taking a shower, so they wouldn't burn themselves. Nice that it fits a family of 5. It's not big, but everything is there. A larger supply of cutlery and bigger cups and mugs would be appreciated. Did you find this review usefull ? The campsite was beautifully landscaped and offers plenty of space. Late check-in was no problem, there was always someone around and the owners were very friendly and helpful. The rooms were very clean and looked new and neat. Everything worked in the kitchen and bathroom and everything was thought of. There was also a TV (but we didn't use it, we explored the region and it’s beautiful beaches) and free W-LAN. The campsite is located on the outskirts of the village in a quiet area, yet the nearest shops were within 5-10 minutes walking distance (bakery, butcher, vegetables and Lidl). Super friendly staff. Perfect Nature ground. The mittlerweile house is Perfect dir a holiday. The path from the street to the point where the wheelchair can reach the mobilhome. The small stones are stabilised near the grass but it is still not a good path for a wheelchair. Sylvain has attention for this. For a couple with one person in a wheelchair it is not easy to find good accomodations. And we hate hotels and their protocols and time tables. We like campigsites and the O Hara Life mobilhomes. It's practical and useful. On thism campigplace it si thereby quiet and the owners are realy human interested and helpfull. calme, proche de PORQUEROLLES, des plages mais aussi des villages de l'arrière pays varois. Mobil home récent, bien équipé, gérants sympathiques et réceptifs. Piscine, animaux acceptés. Situé dans une merveilleuse région, proche de PORQUEROLLES, une perle. L'accueil, l'esprit famille, le calme. Campsited copyright 2017. All Rights reserved.